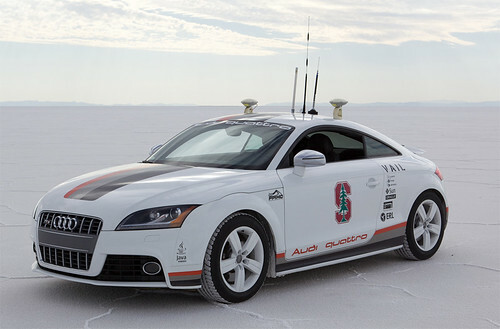 Self-driving cars (SDC) that include driver control are expected to hit highways around the globe before 2025 and self-driving “only” cars are anticipated around 2030, according to an emerging technologies study on Autonomous Cars from IHS Automotive, driven by Polk. In the study, “Emerging Technologies: Autonomous Cars—Not If, But When,” IHS Automotive forecasts total worldwide sales of self-driving cars will grow from nearly 230 thousand in 2025 to 11.8 million in 2035 – 7 million SDCs with both driver control and autonomous control and 4.8 million that have only autonomous control. In all, there should be nearly 54 million self-driving cars in use globally by 2035.
via Self-Driving Cars Moving into the Industry’s Driver’s Seat | IHS Online Pressroom. The report talks about the fact that SDCs will almost certainly have a lower accident rate than manually operated cars. I think that’s right. SDCs will almost certainly be programmed to be supremely conservative. The industry knows that even a single injury, much less a fatality, would set it back decades. This entry was posted in Zeitgeist and tagged Autonomous car, Autonomous Cars, autonomous control, Autos, Business, driver control, Driving, Education and Training, Google, IHS Automotive, Recreation, SDC, self driving car. Bookmark the permalink. At 30,000+/- traffic fatalities and around 2 million(if memory serves) injuries a year in the US alone, they can’t come too soon!